When I think of Seasons, the first thing that comes to my mind is colour – light and bright in summer and sumptuous and rich in autumn. These are the two seasons which I think of immediately, so these form the basis of my piece. 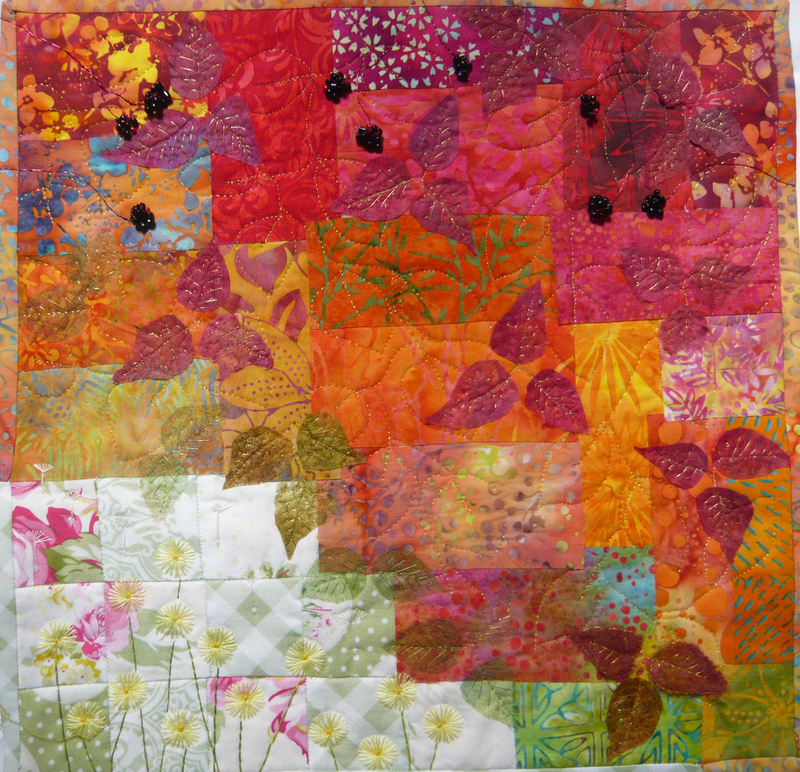 This time I wanted to make my quilt to be fairly abstract, and to convey the feeling of the summer and autumn seasons, rather than make a definite picture. I also wanted to show the contrast between the two seasons, and how they blur into one another, as I find this quite fascinating. Having found a selection of patterned fabrics which remind me of gardens in the sunshine, I decided to use these as the basis for my ‘summer’ section, by piecing small squares of them. Somehow, to me, these say summer picnic outdoors. Next I gathered together all the autumn colours in my stash, and since I wanted these to be more random than the others, I simply bonded them down leaving the edges raw. To me, this reflects the way that formal summer planting softens and breaks down as the season turns into autumn. I machine quilted a leaf design in gold thread to bring the autumn background together. I added stylised summer flowers (I think these are a ‘hybrid’ of daisy and dandelions), in my summer picnic cloth, with some seeds flying above them, heralding the end of summer. I added leaves made from silk paper and needle felt in autumnal colours, with a few greener ones at the edge of autumn. 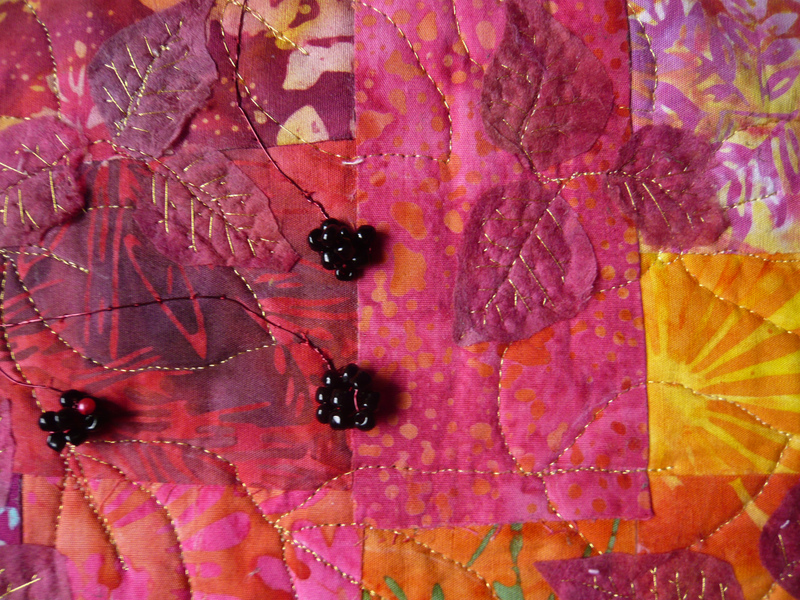 I included some beaded blackberries as reminders that autumn is not just about fading colours, but also brings bounty. Great blending of colours Joan it truly gives the feel of summer through to autumn. The blackberries look good enough to eat, brings back memories of my childhood picking the wild ones from the hedgerows. This piece really gives you the feeling of a beautiful summer and a rich colored autumn. Love the blending of the colors,. The pristine flowers and the beades berries enhances the season feeling. I love the embellishment details in this piece! 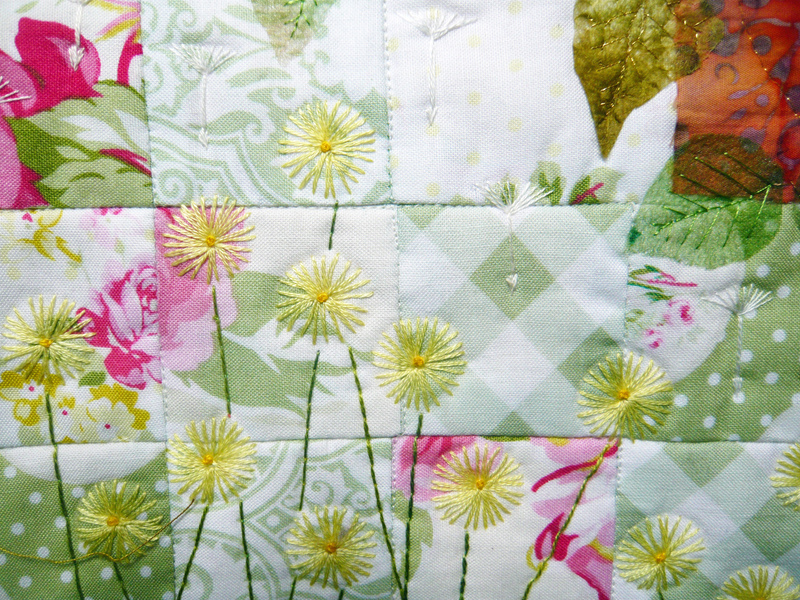 This quilt is really summer and autumn. I like the way you made them connected. Lovely flowers and leaves.